At long last, the wait is over. Fans voted back in November for the bobblehead of their choice, electing Braden Holtby in a landslide over Tom Wilson and Justin Williams. 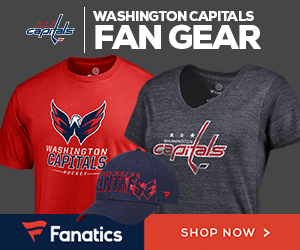 On Tuesday against Calgary, there were more bobbles than fans: 19,008 bobbleheads made their way to Verizon Center, enough for everyone in attendance, and an uncontested sellout for Holtby Bobblehead Inauguration Day. In Holtby’s 300th career game, Holtby became the 14th NHL goalie to win on his bobblehead night. Yes, we have too much time on our hands. As for the bobblehead itself: It’s a beauty. It’s got a real net on a metal post, a loose stick (don’t lose it!) and a wobblin’ prettily-painted head that certainly resembles Holtby. It’s his first stadium giveaway bobblehead (last year’s Holtbeast doesn’t count since its head doesn’t bobble). The water squirting out of the bottle has solidified in mid-air. Don’t feel bad for Wilson or Williams – they each have Caps bobbleheads already. Check out Caps Outsider’s Bobblehead Database. Charlie in his Holtby shirt.